Suntide is a classic inspired slot designed by Microgaming with 9 paylines spread over 5 reels. It’s always summer time when having a spin with sunny symbols including gold coins, gold bars, watermelon, orange, strawberries, lucky 7 and diamonds. The game includes many interactive features, however retains its classic feel and will appeal to Bitcoin players who want an easy to play slot with various bet sizes. The graphics are sharp and gameplay smooth on both computer and mobile phone interface. There is a $75,000 jackpot linked to the game and playable at Bitcoin online casinos for both real money and free play. When playing the suntide pokies all wins are won left to right, apart from scatter wins which are paid in any position. The gold coin symbol acts as wild and can expand to award additional wins. The wild will expand when it completes a winning combination and appear on reels 3 only in the base game. The scatter is depicted by the rising sun symbol which unlocks the free spins bonus. Whenever 3 or more sunrise scatter symbols appear you are on a journey to big wins with 15 free spins on offer. 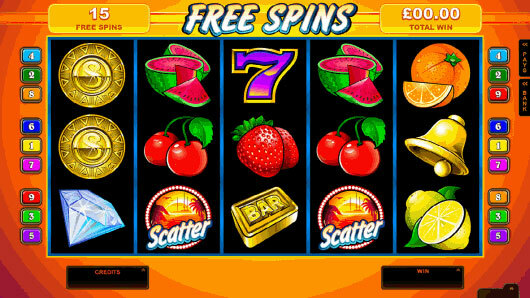 As an added bonus all gold coin wild symbols expanding on reels 2, 3 and 4 during the free spins bonus. The free spins can be retriggered with additional scatters and all bets and line types are the same as originally wagered throughout free spins. With a minimum bet of only 10 cents this game appeals to Bitcoin players of all capabilities whether it be free play or real money gambling. Have a spin on Suntide pokies and capture the essence of a true Bitcoin summer paradise, where big wins are on offer. Follow the sun to unforgettable rewards with a range of bonuses including Expanding Wilds, Free Spins, sunshine Scatters and medallion Wilds.